For the past few years, the organisers of the Australian International Beer Awards have invited their Australian Champion Brewers to collaborate on a beer to be debuted at the subsequent year's awards. 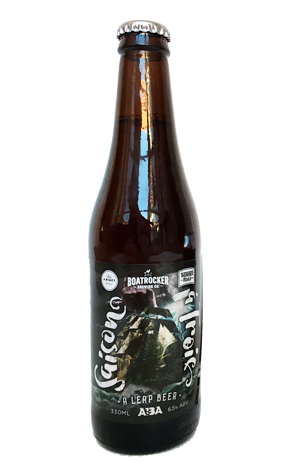 In 2015, the three champs were 4 Pines (Large), Thunder Road (Medium) and Boatrocker (Small), so earlier this year their brewers gathered at Boatrocker to unite their brewing talents. The trio – Chris Willcock of 4 Pines, Marcus Cox of Thunder Road, and Matt Houghton of Boatrocker – decided to create a traditional style, but give it their own twist. As they were brewing at Belgian beer lover Matt's home, they opted for a saison but with added candi syrup to give it a darker hue suited to the autumn launch. Two saison yeast strains, some dried tangerine peel and fresh hops were also added to the mix. The beer, which was first poured alongside a dessert designed by Adriano Zumbo at the 2016 awards dinner (where we learned that Stone & Wood, Two Birds and Pirate Life will be making next year's brew), is a copper coloured drop with the fluffiest of off white heads. From the froth comes red berries aplenty, supported by a touch of soft spice, sweet orange and hints of banana. The rich sweetness of the candi sugar is to the fore to taste too, with flavours reminiscent of Turkish Delight at times, creating a fluffy dessert of a beer. UPDATE: Our mistake. This beer was only available for public consumption at the AIBA Dinner and GABS. If you're desperate to try it, we've got a couple of bottles left here at Crafty Towers...!